I first travelled in the Sahara in 1982 and since 1989 have run occasional desert tours. I organise small-group tours to little visited places or follow unusual itineraries that inspire me, working with local guides or agencies I’ve got to know and trust over the years. I ran an eclipse tour to Niger in 2006, an ambitious crossing from the Atlantic to the Libyan frontier, as well as several motorcycle tours in Libya, Algeria and lately, Morocco. I’ve also run camel trekking tours in Algeria, have joined tours in Mauritania, and with the help of expert contributors, have written an e-guidebook to go with my biking and car handbooks. I don’t produce a regular tour programme or online brochures. I never send out promotional newsletters to mailing lists. I don’t do Facebook or pay to advertise anywhere. The page you see here is all there is. For more about me, click my picture, above left. For 2019 I’m offering my tried and tested 6 or 7-day Fly & Ride formula for Morocco. Dates and links above.The main changes are the addition of a shorter, 6-day springtime tour and bike availability. The aged XR250s have been replaced by 2018 BMW GS310s with off-road modifications. Read about them here. They’re heavier than the XRs, but are less clapped out, lower and technically more modern by about three decades. 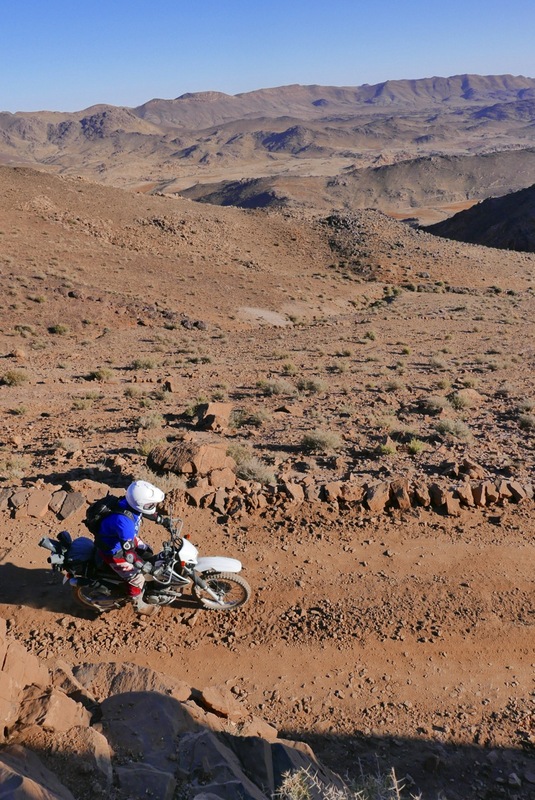 With no more than six bikes, these tours include a few easy half-days off-roading (above), and are pitched at off-roading beginners to give a taste of trail biking and Morocco without getting exhausted or freaked out. The focus is on quiet roads, relaxed lunches, spectacular pistes and ambient Berber mountain lodgings, rather than hammering dawn-to-dusk from one tourist trap to another. More here. Pictures from previous tours here and here FAQs here; contact me here to sign up for 2019. After a few years off I’m pleased to announce that I’m also organising a two-week camel trek in Algeria for early 2020. The walk will cover an easy 150-200kms over 12 days across the plain and dunes below the Ajjer plateau. More on the link. Please contact me if you have a group and want me to organise something unusual like your own Morocco fly-and-ride, or just want to find out what’s possible.